Don't Buy range cookers - Which? Which? 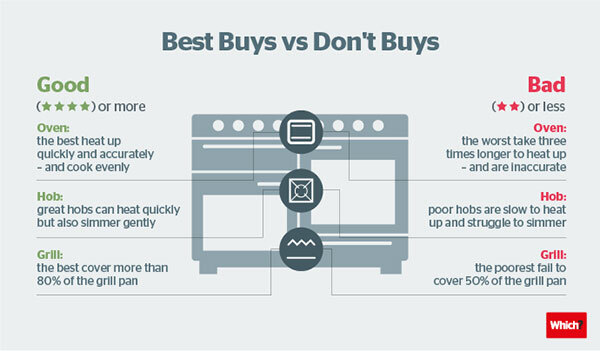 Don't Buy range cookers may have ovens that drastically overheat and grills that won't toast evenly. Discover which models to avoid. If you choose a Don't Buy range cooker, you could end up with something that has a terrible oven that heats up slowly or cooks unevenly. The grill might only manage to cook half of the grill pan area, meaning you're having to constantly move food around. Or the hob might be slow to boil water when you're starving for your pasta dinner. How can Which? reviews help? Which? has reviewed the latest range cookers, including models by Belling, Flavel, Rangemaster and Stoves. Our in-depth tests reveal which range cookers will help provide you with perfectly cooked meals and be a pleasure to use, and also those that will leave you hot and bothered in the kitchen. Every range cooker reviewed by Which? is tested in more than 20 different ways to find out how effective it is at cooking, heating and grilling food – and also how easy it is to use. We bake a batch of shortbread biscuits in the oven to check how they brown and whether the heat is evenly distributed around the oven. We heat up a frying pan and then take a photo of it with a heat sensitive camera to check whether the hob provides an even heat when you're frying food. We fill up the grill pan with pieces of white bread and toast them under the grill to see if provides across the whole grill pan. A poor grill will only heat about 50-60% of the cooking area, meaning you'll have to move your food around regularly. We give every range cooker a Which? test score so you can see the best and worse at-a-glance, plus how each range cooker compares with others on features and specifications. Our Which? tests cover a range of brands, prices and range cooker types, including gas, electric and dual-fuel models, as well as those with induction hobs. Log-in or join Which? to unlock our full list of Don't Buy products on this page.